Note: This is the second article of a three-part series covering plastics in barrier packaging (1) trends, (2) material/process advances and (3) applications. Modern innovations have made it possible to keep food fresh for a much longer time without changing the taste or aroma. Here is a look at some of the recent trends. Oxygen scavengers: While proven barrier materials extend product shelf life by impeding oxygen ingress into a package, oxygen scavengers "capture" oxygen within a sealed package to ensure that oxygen does not react with the food product. Nanotechnology: This is increasingly used to enhance packaging barrier properties. The rapid use of nano-based packaging in a wide range of consumer products has also raised a number of safety, environmental, ethical, policy and regulatory issues. Clear materials: New clear barrier materials are also being developed to replace aluminum foil and other opaque barrier materials, resulting from a trend toward packaging food products in clear materials. Thinner materials: In rigid high-barrier packaging, there is a trend toward monolayer PET (polyethylene terephthalate) bottles away from co-injection/stretch blow-molded and coated PET containers. Using barrier resin blends with oxygen scavenging capability, rigid monolayer bottles with excellent oxygen barrier can be produced on standard injection machines. There is significant interest in developing barrier containers that do not cause recycled PET to yellow. A lightweighting trend in the beverage industry adds another dimension to the barrier coating challenge as thinner walls result in increased permeation in nonbarrier bottles. Bioplastics: The use of bioplastics in food packaging is advancing barrier bioplastic system development. Recently, green plastic barrier packaging material and process alternatives have become available. Let's start off by taking a closer look at renewable content: recyclable plastic barrier material. New ecoPlastic R by Plantic Technologies Pty. is the first ultrahigh-barrier packaging material that is both renewable and recyclable. Plantic developed the new material on the success of its eco-Plastic renewable barrier packaging launched two years ago. Both ecoPlastic and ecoPlastic R are composed of three-layer laminates. However, low-density polyethylene (LDPE) makes up the outer skin layers of ecoPlastic, while PET is used in the outer skin layers of the new ecoPlastic R.
The PET and Plantic biodegradable film provides ultrahigh gas barrier properties and is composed of up to 60 percent renewable materials. The patented Plantic biodegradable polymer core layer is based on the use of high-amylose cornstarch derived from specialized nongenetically-modified hybrid corn. ecoPlastic R food barrier packaging trays. Plantic Technologies has a new commercial supply agreement with Dutch company Profish Food, a sourcing agent, processor and distributor of fresh fish. The partnership will bring Plantic ecoPlastic trays to the European retail fish pack market. Plantic says the ultrahigh barrier performance of its trays will keep products fresher and at peak quality for longer. Continuing in rigid high-barrier packaging, polyethylene furanoate (PEF) bottle development remains on track. Avantium has entered into an agreement with ALPLA for development of PEF bottles, with the first bottles targeted to reach market by 2016. Avantium has also partnered with Coca-Cola and Danone in the development of PEF bottles. PEF is a next-generation, bio-based, recyclable polyester developed by Avantium on the basis of furanics technology. According to Avantium, PEF has 50-60 percent lower carbon footprint compared to petroleum-based PET. Avantium plans to use nonfood-based carbohydrates as feedstock for PEF. 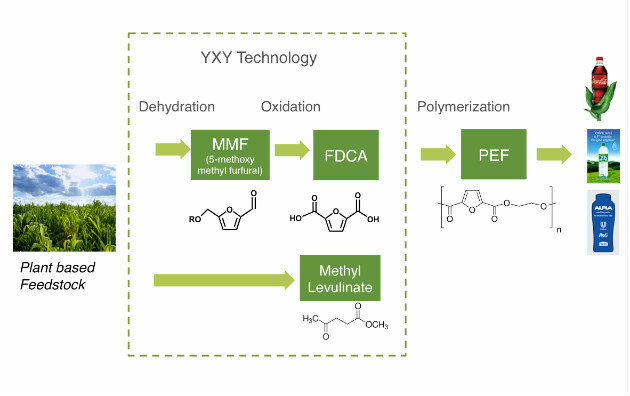 Avantium combines bio-based furan-dicarboxylic acid (FDCA) with renewable-based monoethylene glycol (MEG) to produce a 100 percent bio-based PEF. The company is currently operating a 40 tonnes/year pilot plant in the Netherlands for its PEF and is making plans to build a 50,000-metric-ton plant. Oxygen barrier is 10 times better than PET — PEF's ability to seal out oxygen, results in longer-lasting carbonated drinks. PEF also makes certain packaging coatings redundant, like the coatings used on bottles to keep beer fresh. Melting temperature (Tm) is 235 C vs. 265 C Tm for PET — In terms of thermal properties, PEF is widely considered more attractive than PET due to its superior ability to withstand heat (expressed in Tg) and be processed at lower temperatures (expressed in Tm). Polyethylene furanoate (PEF) polymerization process. Finally, let's briefly review an eco-friendly food packaging coating product development for use on paper and cardboard. The PlantPack project is developing a new sustainable, biodegradable coating for paper and cardboard food packaging. The project, formed by Spanish technological center ITENE, is being funded by the European Commission. The coatings are used as a barrier to protect food products inside the container during transportation and storage. Petroleum-based products used to provide paperboard moisture barrier properties and add strength/rigidity are raising concerns regarding recyclability, sustainability and renewability. Many leading retailers and grocers including Wal-Mart and Costco are demanding an eco-friendly alternative to wax- and polymer-coated boxes from their suppliers. This novel eco-friendly coating product is made from seaweed extracts and starch, for application to paper and cardboard in the form of a spray. 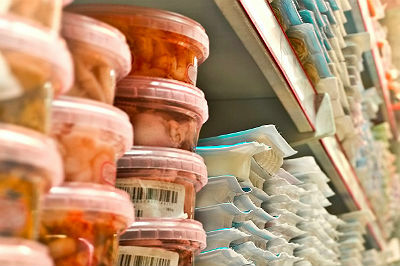 Seaweed extracts such as agar, alginates and carrageenan have been used to develop sustainable barrier materials for food products but never applied as a packaging coatings because of their poor flexibility and limited strength. The PlantPack project will formulate seaweed extracts with starch derivate to overcome these limitations for application to paper and cardboard packaging.